Last week, I did a freebie book day for Write On Blogging: 51 Tips to Create, Write & Promote Your Blog. I submitted it to several book sites, emailed people who I used as examples in my book, and sent it to a few different writer forums. I shared it on all of my social media profiles leading up to it, and inside different Facebook groups the day of my promotion. As I prepared for giveaway day, I realized I wanted to do something a little bit different. So I also scheduled a Facebook Live, to talk about blogging and answer questions from my community. Video is hot right now, and gets a lot of visibility in the Facebook feed. I determined that the primary goal was to share information via video, the bonus (or by the way) was the book giveaway. Here's a peek into the process and a checklist of how to prepare and promote a Live video broadcast. 1. Set a day, time, and topic for your Facebook Live. 2. Create an event for the broadcast through your business page, and schedule it. 3. Invite people who you know will attend. Also message good friends to give them a heads up and make sure you have a base audience at that time. 4. Post reminders in the event discussion the days leading up to the event. 5. Share on all of your social profiles, not just Facebook. Add graphics to make them stand out. Also, add the event to your newsletter and do an email blast. 6. Plan what you will say. Don't necessarily write a script. Instead, create an outline with key points you will cover. 7. If you are doing a live Q&A, source questions ahead of time, so you are sure to have something to talk about. 8. Set up and test your camera ahead of time. Set your audience to "Only Me" to run a test. 9. Message the people on your event that you will go Live on your Facebook business page. Then, go Live. And ave fun. 10. After the event, share the replay on your personal profile, write a blog post and embed it, and share on your platforms yet again. Bonus: Repeat ... when inspired or regularly. Live video is a wonderful way to get who you are in front of your fans. When you film yourself, and interact with people in real time, it enables to form a connection. And as people get to know you, they are more likely to become your clients and customers. What do you think? Have you gone Live on Facebook? How have you promoted it?Please share your thoughts in the comments. 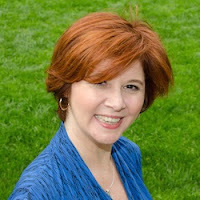 She is author of Write On Blogging: 51 Tips to Create, Write & Promote Your Blog and Purple Pencil Adventures: Writing Prompts for Kids of All Ages and host of the Guided Goals Podcast. 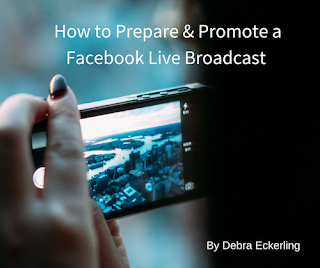 Debra, great tips on using Facebook Live. I've don't live webinars, but haven't used Facebook yet. It's on my list. Thanks, Karen. I typically do spur-of-the-moment short videos on Live, so planning one was new for me. It's easy and fun! Let me know when you go Live, so I can watch! It was a fantastic campaign, Deb. Where do you find that particular event/chat function on Facebook. Is there a secret to the actual technical setup? Thanks, Carolyn. 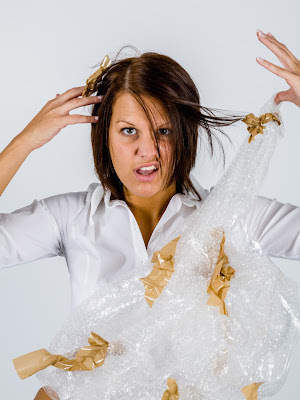 If memory serves, you have a personal Facebook page, not a business page. There are apps you can use to get fancy, but you can easily go Live on Facebook from your desktop or mobile device. On your computer, go to your profile. Click to Post Update, and then you should see a button to go Live. Write a description and click to go. For mobile it's similar. Start it as an update, as well. Let me know if you have any Qs. Perhaps I will go into more detail for next month.